The William G. Lowrie Department of Chemical and Biomolecular Engineering has a rich tradition dating back to 1903. The Department is located on OSU's main campus 5 miles north of downtown. Currently, the department has 20 full time and two active emeritus faculty, 517 undergraduate students, 89 graduate students, and more than 3000 alumni. Chemical Engineering at The Ohio State University can trace its roots back over 100 years. Offered initially as a "B.S. in Chemistry from the College of Engineering," the first degree was awarded to Samuel Vernon Peppel in 1899. Beginning with the 1902–1903 bulletin, The Outline of the Course in Chemical Engineering was listed for the first time. In 1904 the name of the degree changed to "Bachelor of Science in Chemical Engineering." Its first two recipients were the late Arno Fieldner and Lewis Benjamin Case. The first M.Sc. was issued in 1910 to Orlando Sweeney, the first Ph.D.'s in 1918 to Drs. Herbert Spencer Coith and James Howard Young. From 1902 to 1924, chemical engineering was a division of the chemistry department, a common practice among universities at that time. The beginning of chemical engineering education is usually attributed to M.I.T. where the first course in chemical engineering was started in 1888. The first chairman of the Department of Chemical Engineering was Dr. James Withrow, who served from 1924– 1948. In 1925, it became one of the first 10 schools to be accredited by the American Institute of Chemical Engineers. 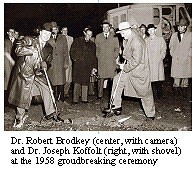 Groundbreaking for (old) Koffolt Laboratories took place in 1958. The building was later named to honor Dr. Joseph Koffolt, who served as the department’s chair from 1948–1968. In 2012 groundbreaking took place for the new Koffolt Laboratories, which is located at 151 W. Woodruff Avenue. New Koffolt Laboratories took over ten years to complete, but was well worth the effort. It now offers students and faculty a top-shelf experience in learning, research, and community.